1301PE is pleased to present its first solo exhibition with the Copenhagen-based collective SUPERFLEX, entitled COPY RIGHT. Fresh from their controversial inclusion in Sao Paulo's 2006 Biennial where their major installation Guarana Power was censored by the foundation president, Manoel Francisco PÃ­res da Costa, SUPERFLEX confronts issues of copyrights, trademarks, intellectual property, the power embedded in these laws and how they affect contemporary society. According to PÃ­res da Costa, Guarana Power, an independent soda bottling plant based in Brazil, was not an "artistic activity," it went against the "purposes foreseen" in the laws of the foundation and that it could upset possible "third party interests." Pires da Costa refused to name the third party interests and how they were linked to the biennial, or give credence that this non "artistic activity" had been viewed at the Venice Biennial in 2003, the Stedeljlik Museum in Amsterdam, Netherlands, Kiasma, Museum of Modern Art in Helsinki, Finland, and Red-Cat, Los Angeles. Continuing in the rich and compelling traditions of 20th-century art collectives ranging from the Bauhaus to Fluxus to Group Material, SUPERFLEX, emphasizes team practice and embraces an ideology that art shouldn't be limited to discreet, unique objects that serve no function. Through collective strength SUPERFLEX has discovered how they can change and improve social and aesthetic structures, with an emphasis on altering assumptions in both art and life. SUPERFLEX challenges the role of artists in contemporary society in having them, think about not only art and design, but also "economic structures of dependency" in relationship to their work. 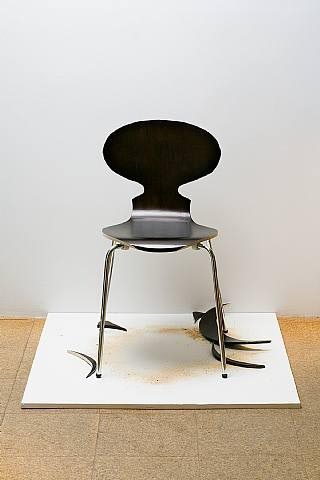 This point is exemplified in COPY RIGHT installation that takes a corrected version of the Arne Jacobsen 'Ant Chair' and by hand-cutting makes it look closer to the original in multiple forms. Like Marcel Duchamp's "ready-made" Urinal, COPY RIGHT challenges the notion of the 'original work.' In an era when the debate of intellectual property and counterfeit objects intensifies, SUPERFLEX exerts a forceful artistic effect in "supercopying" and in creating "new originals." SUPERFLEX was formed in 1993 by Rasmus Nielsen, Jakob Fenger and Bjornstjerne Christiansen. Major solo-exhibitions include 2005 CCA, Warsaw, Poland; SUPERFLEX, Kunsthalle Basel, Switzerland; Guarana Power, Danish Design Center, Copenhagen, Denmark; 2004 Supercopy/Occasionally free/ Open market, Schirn kunsthalle, Frankfurt, Germany; Self-organise/ Guarana Power, Red-Cat gallery, Los Angeles, USA; Superchannel/Superstudent, Galleria Civica di Arte, Trento, Italy; Superdanish, the power plant, Toronto, Canada; 2003 Counter-strike/ Self-organise, Museum of Contemporary Art Kiasma, Helsinki, Finland; Social Pudding, Rirkrit Tirvanija & Superflex, GFZK, Leipzig, Germany. 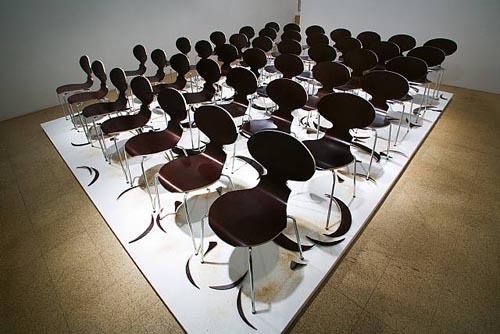 Group exhibitions include 2006 Sao Paulo Biennial; Gwuanju Biennial; Museon Bolzano, Italy; Radical Software, CCA Wattis, San Francisco.